1. Will your axle manufacturer spend the time with you before the sale to make sure you're getting the right axle and the right options for your vehicle and how you use it? Or do they have one flavor that is supposed to work for everyone? 2. Is your confidence in your axle's quality and performance assured because it is 100% manufactured and assembled in the United States? Don't get fooled by others with Chinese parts or weasel words like "assembled in the US." 3. Has your axle been designed from the ground up exclusively with components that are designed to work together? Some use components from other axles that are forced to work together. 4. For the life of your vehicle will you be able to service your axles with off-the-shelf components like brakes, bearings, races, and seals? 5. Can you be assured a "no-fault" warranty if you properly service and maintain your axles? 6. Will your axle be manufactured with built-in caster that will be correct for the setup of your Jeep? Or does it have one-size-fits-all frontend geometry? 7. Will your axle be made from 100% new parts and not with some parts that are recycled, refurbished or salvaged? 8. Will your new axle come with premium parts included in the price such as a nodular iron differential cover, ball joints and OEM-quality suspension bushings? Or will you have to pay extra for these items? 9. Has the casting for your new axle been engineered from the ground up for the type of abuse that off-roading dishes out? 10. With a looming rock approaching your investment, does your axle have the best-in-class ground clearance you need to keep from getting hung-up, stuck, or damaged? Only if it is a patented ProRock axle from Dynatrac! I would like a price on a complete front axle assembly with a dynatrac pro rock 44 with 1\2 tubes for a 2009 jk unlimited (4 door).I would like a detroit electric locker,or what you would think would work better, but no air lockers, also a set of rcv 300m axles with heavy duty knuckles, and timkin bearings and a good quality ring, and pinion 4:88 gears . Anyone have an idea what that would cost? We've forwarded your info on to the tech/sales team. They should contact you, and you can follow up with them at sales@dynatrac.com. Thanks! We’re very happy to provide quotes, but we need to do it by email and/or phone because of the many variations and additional questions that we will need to ask. Please call us at 714-421-4314 or send an email to sales@dynatrac.com. i like a price on a front pro rock 44 complete assemble for my jeep jk 2007.im running 37 tires,4 inch long arm teraflex elite lift kit.thx. 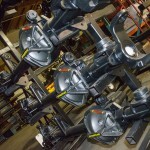 You can find pricing on our most popular ProRock 44 combinations for the Jeep JK here: http://www.dynatrac.com/axle-assemblies/jeep-jk-wrangler/prorock-44.html. For 37-inch tall tires, our ProRock 44 Unlimited is a great solution, with more caster and thicker axle tubes than our standard ProRock 44. These additional features are a benefit with taller tires and more lift. Other options you'll find on that webpage are whether you want the axle to come with stock balljoints or Dynatrac HD Rebuildable Balljoints, and whether you want to re-use your Rubicon e-locker or you will be using a traditional locker or differential. You can always call us at 714-421-4314 or send an email to sales@dynatrac.com if you have any questions or would like additional information. Can you build a set of dana 60 front and dana 70 rear axles for a 1st gen dakota? if its posssible.